It's taken almost a year, but here's my first review for the OX3 postcode. Shameful or telling? Well, Headington's not local for me and nor is it in the way of much passing trade, unlike the bar and boutique hubs of Jericho and Cowley. Tucked away from the main road, Old Headington is even less accessible. So when a restaurant located there is repeatedly recommended, it seems like you're on to a winner. The Black Boy certainly has some champion credentials, not least a glowing review from The Observer's Jay Rayner and an appearance on the 50 best gastro pubs in the country list. Frequently billed as a gastro pub, I found the reality more akin to a restaurant: the leather-backed chairs and elaborately patterned wallpaper didn't really scream 'pub dining room' to me. Whatever bracket The Black Boy falls into, it's an inviting spot: welcoming, well-decorated and intimate without being cramped. 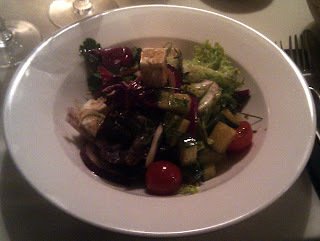 M and I visited on a Tuesday evening to spend a Living Social voucher valid for 2 courses and 2 glasses of wine. We chose from a set menu that was less limited than I had feared: 3 starters and 4 mains were on offer, with a meat, fish and vegetarian option for each course. I opted for a Greek salad followed by fish pie, while M chose a smoked haddock and salmon fish cake to start and bangers and mash for her main. The house wine was decent and cheap at just £3 a glass, while the rest of the wine list was varied and well-priced. The main menu is British with international influences, with starters including potted English trout and shrimp served with toasted homemade bread (£6.95) and Clonakilty black pudding with a soft poached egg and pancetta (£7.50). Starters are a little on the pricey side (mostly around the £7 mark), with mains such as roasted cod loin with spring onion and potato rosti, mussels and a cream and saffron sauce more reasonable around £12.95. There are also plenty of specials to choose from: 3 starters and 4 mains on the day we visited. At lunch time, sandwiches are also available, but don't expect a chunk of cheese wedged between hunks of bread: at £6.50 plus, these are deluxe doorstops. Even after polishing off two slices of homemade bread, I was ready for my generously-sized Greek salad. You know what you're getting with a Greek salad: feta, tomatoes, cucumber, red onion. And apparently, loads of herbs. I can't say they were an entirely welcome addition, especially the dill - I found I was picking bits out of my teeth for the rest of the evening. A winning look, I'm sure. M's mammoth smoked haddock and salmon fishcake served on a bed of wilted spinach with a beurre blanc was much more successful: with a crispy crust, a lemony taste and plenty of fish filling, it was a more than satisfactory starter. Our fortunes were reversed when it came to the main courses. My fish pie was comfort food at its best: creamy, just a little bit cheesy and packed full of chunks of salmon, potato and carrot. 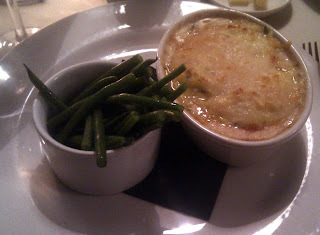 Accompanied by green beans, it was hugely filling yet moreish - I'd definitely order it again, given that it graces the main menu for £10.50. M's bangers and mash was served in a huge portion but failed to delight. Although the sausages were tasty, the lumpy mash was a little more reminiscent of school dinners than gastro fare. Still, the beer jus the bangers were cooked in helped to redeem the dish. Suitably full, we passed on the selection of classic desserts (around £6.50) and headed on home, pleased with our bargain evening. 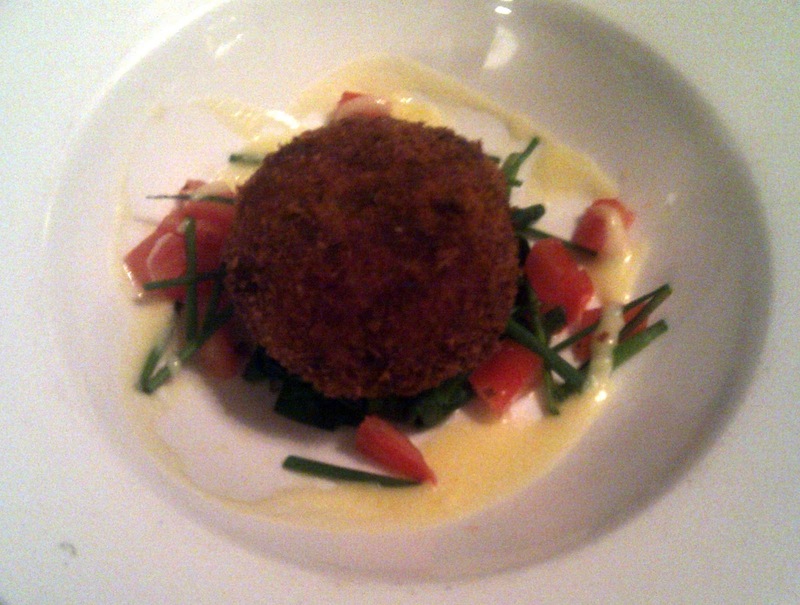 With good service, a warm atmosphere and decent food, The Black Boy makes a detour into Old Headington worthwhile. Judging by the almost packed dining room on a Tuesday evening, it seems the rest of Oxford thinks so too. If you're after somewhere smart-casual rather than a gastro pub such as The Rickety Press, it's definitely a reliable choice. The jury's still out on the rest of OX3, but I'd return to The Black Boy another go. The Black Boy is at 91 Old High Street, Headington, OX3 9 HT. Tel: 01865 741137. I'll be talking about Italian restaurants in Oxfordshire on BBC Radio Oxford on Friday 9 March from 1pm. You can listen online live or for one week afterwards through this link.